The Yankees have less than two weeks until their season begins with a clash against the Orioles. There's still time, however, to make roster improvements. New York will have to wait until the end of Spring Training for other team's non-roster invitees or cuts to become available. The Yankees haven't made tremendous use of this route recently, though they added backup catcher Chris Stewart on the eve of Opening Day in 2012. For now, GM Brian Cashman can look to the free-agent market, which still contains a few big names and potential hidden veteran gems. While New York is unlikely to splurge on a high-priced player at this point, the team still has room for pitching depth like the rest of MLB. These are the longest of longshots at this point. The two top-tier free agents remaining, both Keuchel and Kimbrel are searching for long-term commitments. As evidenced by their lack of a team right now, neither has gotten that kind of offer. The Astros reportedly engaged Keuchel in talks to re-sign him recently, though they were only offering short-term options. Of course, either player would add to the Yankees, but it's hard to imagine them signing. The Yankees already have a stacked bullpen and signing Kimbrel wouldn't fit their use of resources considering their stable of arms. Furthermore, Kimbrel wants to close, and the Yankees have Aroldis Chapman in place. As for Keuchel, he'd have made plenty of sense at the beginning of the offseason with the Yankees pursuing three rotation arms. However, after adding James Paxton and re-signing J.A. Happ and C.C. Sabathia, New York has its five starters. Both Sabathia and Luis Severino will start the season on the injured list, but Keuchel isn't signing to eventually become a depth starter, nor are the Yankees likely to displace one of their current crop. Gonzalez is the best of the rest with this free-agent market. 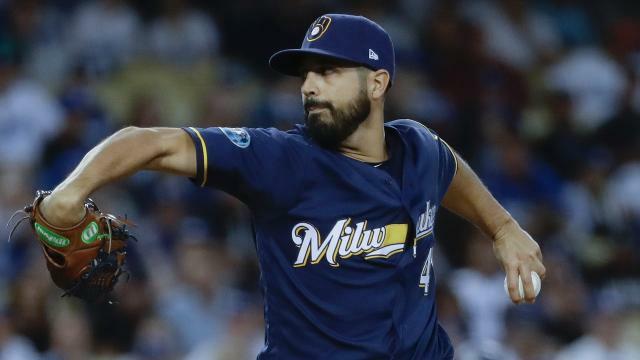 Alhough he struggled in his final season with the Nationals, he put up five solid starts in Milwaukee before pitching in the postseason in 2018. The 33-year-old lefty is someone who walks a lot of batters. He's twice led the league in walks, though both those seasons were strong campaigns. He makes up for the walks with high groundball and strikeout rates, but both have decreased as he's reached the wrong side of 30. If he joined the Yankees, he'd be going from a pitchers' park to a hitters' park. He'd also need to be fine with being sixth in the pecking order, as he could likely find a more appetizing situation elsewhere. The Yankees seem content sticking with their young depth starters, but Gonzalez would be an upgrade, even in decline. He's a five-and-fly starter who'd fit the Yankees with their dynamite bullpen. While playing for his record-tying 13th team in 2018, Jackson put together a 3.33 ERA in 92 innings, a surprising rebound after his career looked moribund in 2016-17. He greatly outperformed his underlying metrics, which is perhaps why he's still looking for an opportunity. Like Gonzalez, Jackson walks more than three batters per nine innings. He gives up plenty of home runs, although he was able to limit the long ball in 2018. The veteran was the lone starter on the Athletics' Wild Card Game roster, but he didn't appear in the game. Would Jackson fit the Yankees? If he's willing to take a Minor League deal like he did last year, he's certainly worth the look as he's an upgrade over Drew Hutchison and others who'd pitch in Scranton. However, his chance of making a positive impact in the Bronx isn't especially high. As mentioned with Kimbrel above, the Yankees already have more than enough relief pitching depth for Opening Day. Ramos, on the other hand, won't be ready for the start of this season and would be a lottery ticket for down the road. The former All-Star had labrum surgery on his right shoulder last summer and will miss a good portion of this year. Before his injury-plagued Mets tenure, he was a reliable reliever in Miami and could give the Yankees, or any team, late-season value. Classically, players like him have signed deals for one year plus a team option, as the Yankees did with David Aardsma in 2012. If you get something out of Ramos in 2019, great. If not, he'd still be an option in 2020.